Halloween is fun, but I’m not someone who is incredibly into the holiday, like some people I know. I have friends and family whose favorite holiday falls on October 31. For me, I like it enough. I never really got to do the whole costume or trick-or-treat thing growing up. And my life involved pretending to be so many things other than myself, it was exhausting, so I’m not sure ‘pretending’ would have appealed to me, even if I had the chance, like it does others. But I get it. Pretending to be someone else can be fun. You can try on a different face, another character, and not have to face any judgments (for the most part) afterwards. It is a time to be experimental, put on a face that you have always wanted to wear, and just have fun. 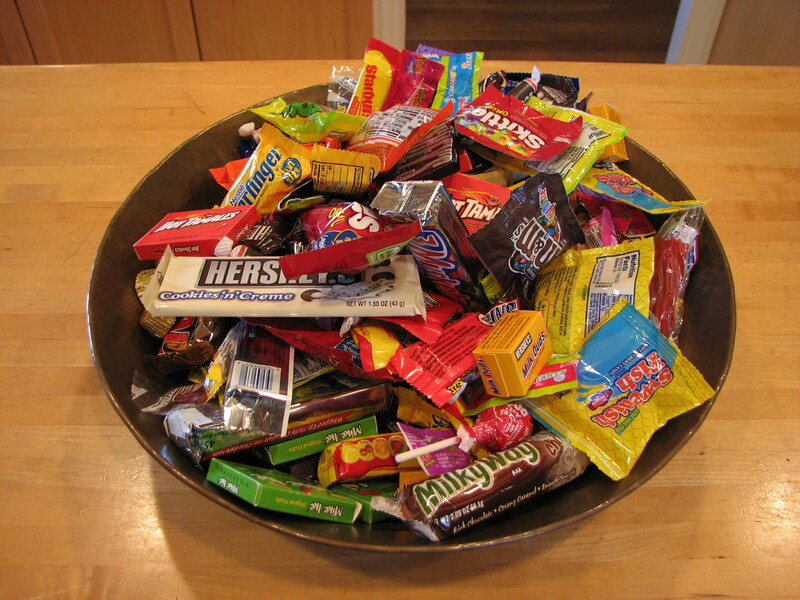 And let’s not forget – CANDY! I mean I think that for most kids, it is as much about the candy as it is about the costumes. I mean I’m an adult, and I am totally about the candy! 😉 I love passing out the candy to all of the trick-or-treaters who come a knocking. We seriously get over 100 kids every year – and that is not an exaggeration. When the day comes that Roy (my husband) and I finally have kids, I know I will be much more excited about the holiday. I can see myself getting excited about whatever my kids choose for their costumes, buying it or making it myself. I think about doing a kid-friendly haunted house in our home or having a fun-for-the-family Halloween party (both children and adults). But for now, it’s just my husband and me. So it really is all about the candy. I guess that’s why the real holiday for me is on November 1, beginning at midnight: all Halloween candy is half off at your local store! This entry was posted in Family, Halloween, Holidays, home, Personal and tagged candy, chocolate, costume, fun, pretend, tradition, trick-or-treat. Bookmark the permalink.